With combative couples, it takes not one difficult person but two individuals who exhibit a high degree of inflexibility and disturbance to create such poisonous interaction. The other qualities that make them so unique among the clientele who seek marital therapy are the intensity of their conflicts, the vested interest they both have in maintaining their argumentative behavior, the perverse enjoyment they seem to derive from the ritualized combat, and the degree of resistance they show to changing their dysfunctional patterns. Greenberg and Johnson have developed an emotionally focused therapy for couples that seeks to access primary emotional experiences of each partner, and then helps each one communicate these feelings in ways that the other spouse can hear and respond to. This is standard operating procedure in many forms of marital therapy. Each partner is helped to express the feelings that underlie the hostility, whether it is the fear of abandonment, engulfment, or intimacy. In the case described earlier, for example, Fran is encouraged to share with her husband the underlying feelings of mistrust and hurt that she expresses through anger. Simultaneously, Stan is assisted in his efforts to express his fear of losing his wife and how he covers up his vulnerability by keeping her off balance. Some would disagree that more direct and open communication is possible, or even desirable, with combative couples. Behaviorally oriented marital therapists would home in much more directly on those actions that are counterproductive and attempt to substitute for them more caring responses. 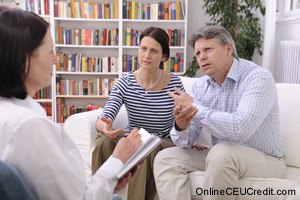 Structural therapists might work to realign the power balance within the couple while strategic practitioners would be more concerned with disrupting the dysfunctional communication patterns. Others, such as Nichols, prefer an even more pragmatic approach with polarized couples, concentrating on helping the partners to renew their commitment to one another, bridging misunderstandings between partners, and rebuilding the trust that has been ruptured. Reducing all these interventions to their essence, Shay reminds us of the most basic therapeutic principle of all when working with discordant couples who fight a lot: EVERYBODY WALKS OUT ALIVE. As I mentioned earlier, like many members of our profession, I came from a conflicted family. My parents fought constantly. I fell asleep many nights to the sounds of slamming doors or screaming voices. While I was unsuccessful at keeping my parents from divorcing, at age ten I decided I did not like being around people who were cruel to one another, and I did everything within my meager power to stop people from hurting one another. Bergman finds it especially helpful to assign homework assignments to couples trying to devour one another. Each evening the couple is instructed to spend five minutes each telling one another the ways that they feel hurt. They are to use only the pronoun I throughout the exercise and to refrain from blaming the other, attacking, or becoming angry. While one partner speaks, the other listens quietly and finally responds with an apology to the effect that he or she has been unaware of the hurt, feels badly about it, and then asks for forgiveness. Although these assignments can be potentially problematic or even dangerous without adequate supervision, most of the difficulties can be circumvented by first having the couple practice the exercises in the sessions before trying them out at home. This strategy will probably work for only about half the couples who comply with the task, but half is certainly impressive. And the other half, who will not comply, can always be given the paradoxical assignment of arguing more often.